Sitting for hours – and indeed, cumulative days and weeks and years – on end at a desk is ruinous to one’s health and happiness. Work must be done to live in modern society, it’s true, but the trouble is that unlike ages past, the modern world’s work tends toward sedentary, unmoving drudgery. Geekdesk, however, is out to change all that. As a company, they aim to re-introduce a little activity into the working world through the use of a Standing Desk. Both anecdotal evidence and medical studies have proven that even something so simple as standing to accomplish one’s work can prevent and even reverse the terrible consequences of habitual immobility, which can include everything from simple aches, pains, and productivity decreases to deep vein thrombosis (DVT), heart disease, and stroke. With this in mind, Geekdesk has produced an array of height-adjustable desks. Users can work in both the seated and standing positions, changing throughout the day as their bodies and workflow dictate. Their entry-level model, the Version 3 Geekdesk – we’ll call it the Geekdesk, v.3 from this point on for the sake of clarity – is arguably the most popular, and as such, it will be the focus of this Geekdesk review. Keep reading to learn more about the Geekdesk v.3, what makes it so unique, and how it can change your life for the better. The frame (which you can buy separately if you want or need a spare) is made of anti-scuff / scratch coated steel, and made with a view toward strength and stability throughout the entire range of heights and positions the Geekdesk v.3 is capable of achieving. This makes for an attractive, rock-solid work surface regardless of whether you’re seated, standing, or somewhere in between. The frame mentioned above comes in small, medium, and large sizes, with accompanying tabletop / desktop surfaces to match. 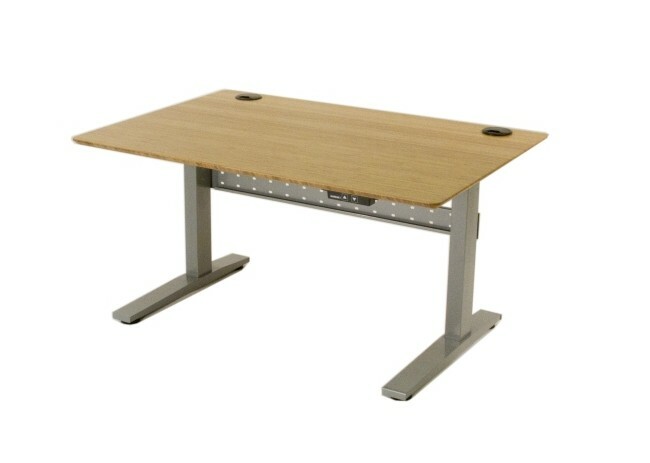 This makes the Geekdesk ideal for most work environments. Adjustments to the height / position of the Geekdesk v.3 are made by internally housed motors. These motors are both non-obtrusive and virtually silent, so there’s no need to worry about a lot of bulky equipment or ambient noise. Speaking of which, the Geekdesk is capable of raising to a maximum height of forty-eight and three-quarters of an inch from a minimum height of twenty-three inches. The Geekdesk v.3 has a maximum load bearing capacity of two-hundred seventy-five pounds. It should be noted, though, that this figure is inclusive of the desktop. Given that the typical weight of Geekdesk’s line of work surfaces (that is, the desk “half” of the unit independent of the frame) is anywhere from thirty to sixty pounds depending upon which size is being used, the actual load bearing capacity of the v.3 is closer to 210-240 lbs. Any computers, books, or other work-related equipment will need to come in at or under this threshold, as using the stated parameters can result in injury or damage to property. Frankly, given the quality of the unit and Geekdesk’s own reputation, this erroneous statistic seems like a needless oversight on the part of the company. The Geekdesk v.3 comes with a pretty nice warranty attached; moving parts are covered for two years, and the frame itself is covered for five. While Geekdesk will ship any parts needed for covered repairs at no cost to the user, it’s the user’s job to make the repairs, which usually means hiring someone from an outside company. Many users like to compound the beneficial effects of a sit / stand desk setup by using a treadmill. While the Geekdesk v.3 can certainly accommodate a treadmill – many users find the Lifespan 1200-dt3 to be the ideal fit in this regard – this desk is more akin to a table than a traditional office desk. This means that with the possible exception of an articulated monitor bracket, the Geekdesk v.3 is devoid of peripherals like keyboard trays. This shouldn’t necessarily discourage potential treadmill users from using a treadmill / Geekdesk v.3 combo – not by any means! After all, the relatively huge work surface offered by a unit like this may be exactly what the proverbial doctor ordered. It’s simply something to keep in mind. While the frame of the Geekdesk v.3 is, as previously mentioned, made of polymer coated steel, there are a few options for the desktop itself. Buyers can choose from a beech veneer desktop with an anti-UV coating and smoothed edges and corners or a desktop with vinyl-wrapped edges and corners made from a black laminate material. Finally, if they’re feeling particularly fancy, a multi-layer carbonized bamboo desktop is also available. By now, most prospective Geekdesk buyers are probably convinced of the virtues possessed by the Geekdesk v.3. Still, the prudent shopper knows there’s never a bad reason to do that extra bit of research, and the logical next step when it comes to the Geekdesk v.3 is to ask about alternatives. As it happens, if you can’t find the right fit from within the Geekdesk line of products, the Vertdesk is a great Geekdesk alternative. WHAT ABOUT RETURNS AND OTHER ISSUES? Geekdesk has a great reputation for dependability and customer care, but even the best companies get returns. Whatever the reason, those wishing to return their Geekdesk v.3 can do so at their convenience. Be advised, however, that unless this is a non-permanent return related to covered repairs, which are always free, the customer will be charged approximately $125 USD. There’s also a backlog of +/- two months, making the issue of returns more complex than it normally is. Finally, while this won’t bother most consumers, there is a segment of the population that likes to “buy American”, whether for reasons of quality, political leanings, or otherwise. As such, all prospective buyers should be aware that the Geekdesk v.3 is made in China. In fairness, it should also be said that location of manufacture notwithstanding, the Geekdesk v.3 meets U.S. and E.U. standards of quality. And there you have it – a thorough, in-depth Geekdesk review! By now, anyone interested in buying the Geekdesk v.3 should have a keen grasp of all its major selling points as well as its handful of shortcomings. The ultimate buy / pass decision is, of course, up to the reader, but if there’s one takeaway from this Geekdesk review, it’s this: The Geekdesk v.3 is a solid piece of workplace furniture, and provided it’s used and maintained well, will pay its new owner back in kind for years to come. Happy shopping!